Following the award to the Peak Tramways Company of an additional 10-year period operating rights from 2026 to 2035 for the Peak Tram the Hong Kong Government has also approved the company's upgrade plan. The project, estimated to cost HK$684 million is being wholly funded by The Hongkong and Shanghai Hotels Limited which owns the Peak Tramways Company. The project, which began in late 2018 will see new tramcars which will increase the current capacity of 120 passengers per trip to 210 and include new air-conditioned queuing and waiting areas for up to 1,300 passengers and is expected to be completed in 2021. During the construction period there will be two service suspension periods, the first from 23rd April 2019 for a period of two or three months followed by a suspension of about five months during the summer of 2020 for about five months. The Peak Tram will operate from a temporary platform at the Lower Peak Tram Terminus on Garden Road in between the two closure periods. 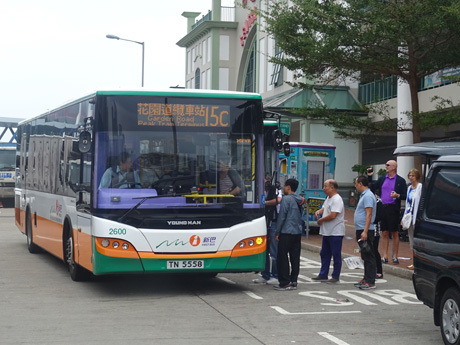 The Peak Tower and Sky Terrace 428 will remain open as usual and the company is working with transport operators to ensure adequate alternative public transport to The Peak is available during the closure periods. During the first closure period from 23rd April a special bus route X15 will be operated by New World First Bus (NWFB) from Admiralty (West) Bus Terminus near MTR Admiralty MTR Station Exit B direct to the Peak with no intermediate stops. The service will operate from 7am to 11-30pm from Admiralty and 8am to midnight from the Peak. Existing NWFB bus routes 15 (Central Ferry Piers - Peak) and 15B (Sunday and public holiday only) Hong Convention & Exhibition Centre, Wan Chai - Peak) will continue to operate as usual but NWFB route 15C (Central Star Ferry Piers - Garden Road Lower Peak Tram Terminus) will not operate. 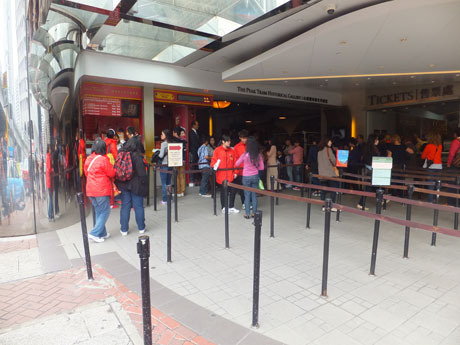 Green minibus route 1 (Hong Kong Station Public Transport Interchange - The Peak) will operate as usual. Services of bus 15 and 15B and green minibus 1 will be strengthened to meet demand as necessary. Passengers at the Peak Tram Lower Terminus can take bus route nos. 12A, 12M, 23, 40 or 40M from St John's Cathedral bus stop on Garden Road to Admiralty and interchange for the special route no. X15 to the Peak. 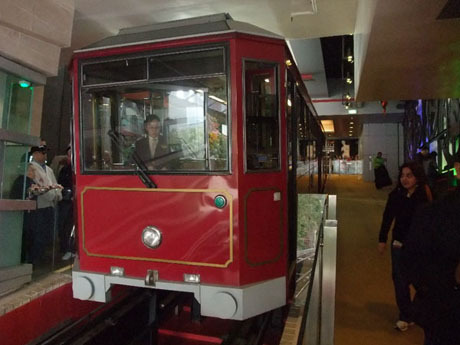 The Peak Tram is operated on behalf of the Hong Kong Government by the Peak Tramways Company Limited, owned by Hong Kong and Shanghai Hotels. 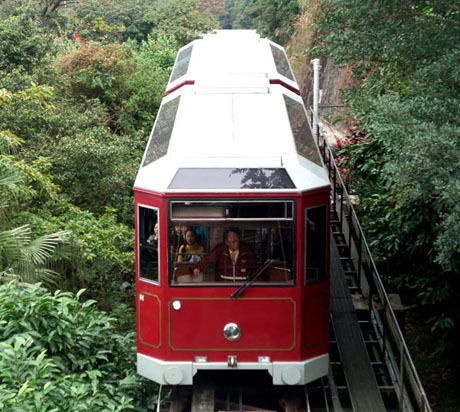 It is a 1.4 kilometre funicular railway connecting the Central district of Hong Kong with the Peak. 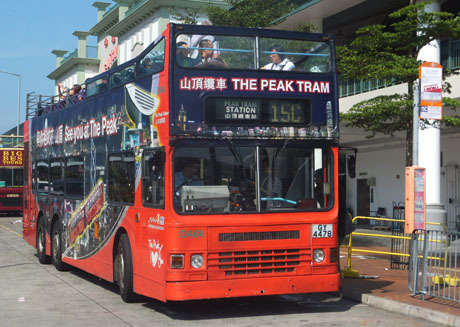 The Lower Peak Tram terminus is located at Garden Road and the Upper Peak Tram Terminus is located inside the Peak Tower, 396 metres above sea level and 150 metres below the summit of Victoria Peak. The journey is steep, with the sharpest incline at 45-degrees, and is spectacular with panoramic views over the northern coast of Hong Kong Island, Victoria Harbour and Kowloon. 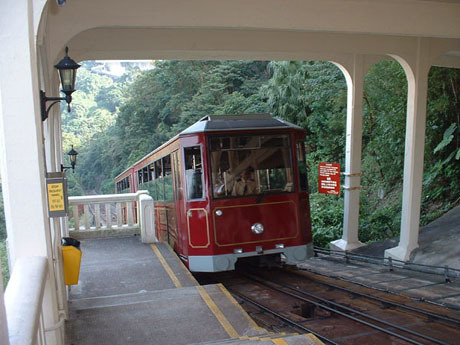 The tramway, which took three years to construct and first opened to the public in 1888, was the main route to the Peak and only form of transportation other than sedan chair until Old Peak Road opened in 1924. 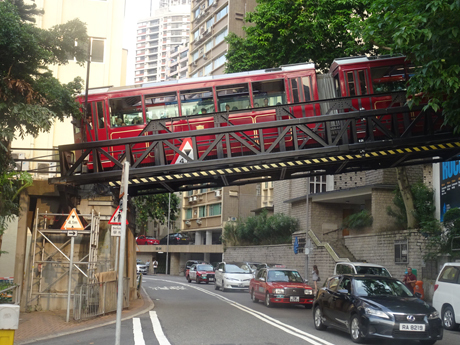 It was the first mechanical public transport in Hong Kong and is the world's steepest funicular railway. The Peak Tram was the brainchild of Scottish hotel owner Alexander Findlay Smith, whose Peak Hotel opened in 1880, eight years before the tram began operating and burned down in 1938. The first generation trams from 1888 had no doors. The 30-seat trams were divided into three classes with the first two seats being reserved for the governor and passengers being reminded by a brass plate behind these seats. The governors summer lodge, Mountain Lodge, was located at the top of the Peak at that time. Passengers were only allowed to sit in these seats if the governor had not arrived two minutes after the tram had departed. The first-class fare was 30 cents, second-class 20 cents and third class 10 cents. The governors seats were discontinued from the second generation trams which were introduced in 1926 and until the 1960's there were two classes of seating, one for the rich and one for servants. Between 1904 and 1947 only Caucasians were allowed to live on the Peak unless granted an exception by the governor and in those days patrons of the Peak Tram were mostly wealthy foreigners and their domestic workers. The trams were originally steam-driven until an electric cable haulage system was introduced in 1926. The current modernised enclosed two-car articulated trams and Swiss-built microprocessor controlled operating system were introduced in 1989 and are the fifth generation of trams. The two trams run in opposite directions and each has a passenger capacity of 120 passengers (95 seated and 25 standing). Trams operate at about 10/15 minute frequency and the journey from terminus to terminus takes about 8 minutes with a maximum speed of 21.6 km per hour. The tramway can currently operate up to 245 daily trips carrying a maximum of 30,480 passengers. 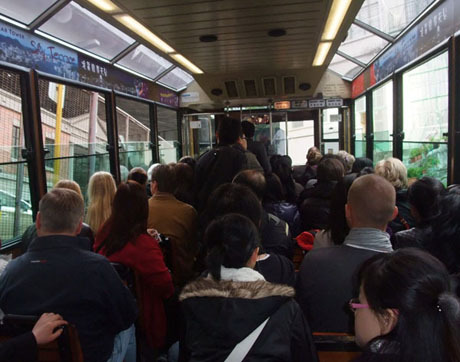 At mid-2013 the average daily patronage was about 16,250 passengers. The peak hours on weekdays are 5pm to 7pm and the average waiting time is about 30 minutes. This can be much longer at certain times on weekends and public holidays. There has never been an accident involving the Peak Tram and, other than for maintenance or adverse weather the only time the Peak Tram service stopped public operation was during the Japanese occupation of 1941-45 when the trams were used for transporting arms to barracks on the Peak. In December 2013, the Peak Tramways Company was granted an extension of operating rights for two years until 31st December 2015 for a non-refundable land premium of HK$25 million for government land on which the tramway lies. The government has since considered long term arrangements for operation of the Peak Tram. New legislation by way of the Peak Tramway Amendment Bill (2015) is being introduced in May 2015 to enable the government to offer operating rights to any suitable operator from 1st January 2016 for periods of up to 10 years with the option of a 10 year extension. This has been necessary as previous legislation does not provide for a mechanism for an incumbent operator to exit and for a new operator to replace it. The Bill provides for an exit mechanism, ensures that the new operator would be able to take possession of the assets essential to the Peak tramway operation and provides the legal basis for the mandatory lease arrangements concerning land and related premises and the mandatory sale arrangements concerning other assets. Reasonable compensation would be offered to the owner of the assets. The Peak Tramways Company Limited, the incumbent operator of the Peak tramway, owns the two sites on which the two termini of the Peak tramway are located and the related premises as well as other assets essential to the Peak tramway operation. It has a good service and safety track record in operating the Peak tramway and in December 2015 the Government granted the Peak Tramways Company a new 10-year operating right from 1st January 2016 for an annual sum equivalent to 12% of annual revenue for the occupation and use of Government land on which the track of the peak tramway and the four intermediate stations lie. The Company will also set a service pledge on service frequency of the peak tramway. 10-year operating period. The system is expected to be closed for one month in 2019 and three months in 2020 before completion of the renovation in 2021. The lower terminus is situated underneath St Johns Building on Garden Road (near Hong Kong Park, the Citibank Tower and distinctive Bank Of China Tower) and the upper terminus is located inside the Peak Tower. There are intermediate stations at Kennedy Road, Macdonnell Road, May Road and Barker Road. 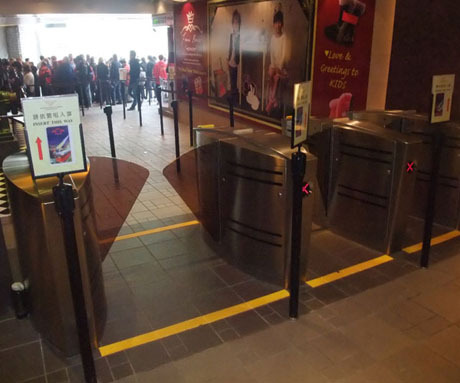 Each of these stations is equipped with a stop request system although at busy times it may not be possible to board at intermediate stations as the train may be full to capacity. 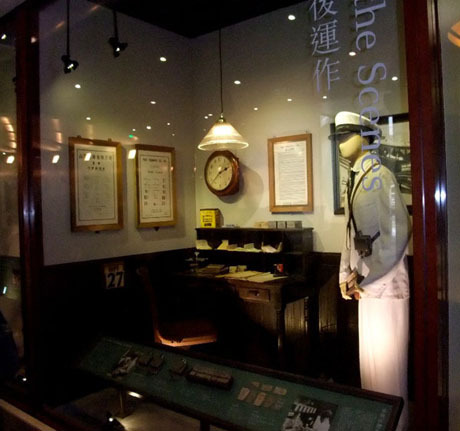 Located at the Lower Peak Tram Terminus on Garden Road, in the concourse inside the platform entry barriers, the Peak Tram Historical Gallery features fifteen window displays with memorabilia illustrating the history of the Peak Tram during the 19th and 20th centuries. Exhibits include a replicas of a first generation Peak Tram carriage, the 1926 Haulage Room, ticket office and various uniforms. Admission is free for all passengers using the Lower Peak Tram Terminus. The Lower Peak Tram Terminus is located on Garden Road and is served by New World First Bus (NWFB) service 15C from outside Central Pier 8 on Hong Kong Island, and which also stops outside City Hall on Connaught Road Central. The bus service operates daily at about 15 minute intervals from 10am until 11-40pm and the journey takes about 10 minutes. The adult fare is HK$4.2. The service had been operated by both open-top double deck bus and single deck bus but the open-top bus was withdrawn in March 2014 having reached the end of its life. 15C bus at its starting point outside Central Pier 8 (adjacent to Star Ferry Pier - Central Pier 7). An open-top bus used on this service was withdrawn in March 2014 and the service is now mainly operated by and single deck buses. The Lower Peak Tram Terminus can also be reached ON FOOT FROM CENTRAL OR ADMIRALTY MTR STATIONS within about 15 minutes walk. Garden Road where the Lower Peak Tram Terminus is situated is easily located by heading for the prominent Bank of China Tower (the very distinctive geometrically shaped glass sided tower with "forks" shooting up from the roof). Adjacent to the Bank of China Tower is the tall box-like structure of the Cheung Kong Centre and Garden Road runs uphill between these two buildings. The terminus is located near Citybank Tower at the first set of traffic lights. FROM CENTRAL MTR STATION take Exit J2 or Exit K. Exit J2 leads to Chater Garden from where Bank of China Tower is clearly visible. Exit K leads to Statue Square opposite the HSBC Building and the Bank of China Tower is visible to the left. From Bank of China Tower follow Garden Road uphill to the terminus. FROM ADMIRALTY MTR STATION take exit C1 and cross the bridge over Queensway to Pacific Place. In Pacific Place take the escalators on right which run up alongside the shopping mall. Go to the very top and cross the road to Hong Kong Park and follow the signs through Hong Kong Park to the Lower Peak Tram Terminus. See VICTORIA PEAK (The Peak) for more information about the Peak.